Hawaii, (Hawaii) Hilo P.O., Hawaiian-Islands, Apr 27, cds (242.13) on reverse of cover to Lyndonville, N.Y., franked with 1866, 5¢ blue, horizontal strip of three tied by grid handstamps, red "Honolulu, U.S. Postage Paid, May 9" and red oval "Hawaiian Steam Service" handstamp above, red crayon "10¢" denoting U.S. postage portion which was be attempted to be paid with Hawaiian stamps, 1868 docketing at top, F.-V.F., an unusual usage. Scott No. 32 Estimate $750 - 1,000. Carried on the COMSS Idaho, departing Honolulu on May 9, 1868, and arriving in San Francisco on May 22nd. 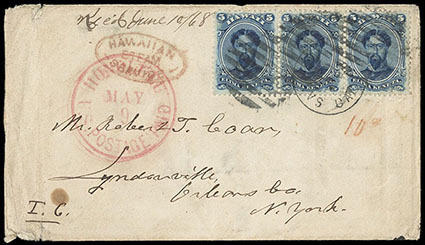 Hawaii, (Hawaii) Olaa, 4 June 94, two manuscript postmarks (803, 1R) on 1894, 1¢ yellow, horizontal pair; left stamp with small tear at top, otherwise Very Fine, very scarce in multiple format. Scott No. 74 Estimate $300 - 400. This manuscript postmark was used for a short time from May 25th to July 9th of 1894 prior to receiving a handstamp date stamp at this office. 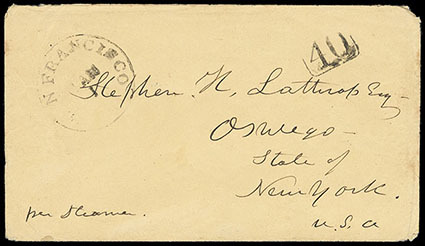 Hawaii, (Hawaii) Olaa, 6 June 94, two manuscript postmarks (803, 1R) on 1894, 1¢ yellow, horizontal pair; right stamp with light corner crease, otherwise Very Fine, very scarce in multiple format. 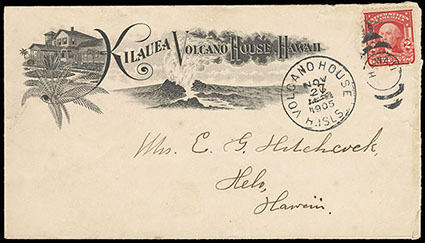 Hawaii, (Hawaii) Volcano House Territorial Covers, 1902-13, three illustrated corner card covers (two different styles) with Volcano House postmark, also two post cards showing Kilauea Volcano, one with Volcano House postmark, also an interesting modern item; some flaws to two of the covers, Fine. 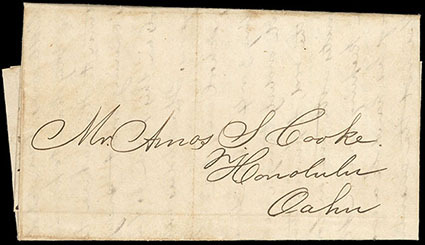 Hawaii, (Hawaii) Waimea, Jan 13th, 1838, dateline on 3-page folded letter from H.O. Knapp to Amoa S. Cooke in Honolulu, letter regarding teaching school, Very Fine Interisland Usage, ex-Fitzpatrick. 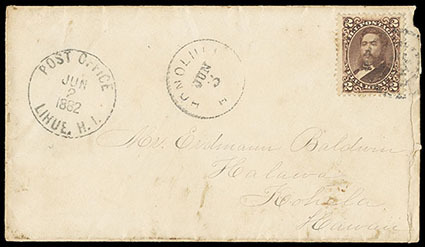 Hawaii, (Kauai) Lihue, H.I., Post Office, Jun 2, 1882, complete strike of cds (238.02, 1R) on cover to Kohala, franked with 1875, 2¢ brown tied by segmented target handstamp, "Honolulu, H.I., Jun 3" cds; slight rough opening at right, Very Fine, a rare Lihue postmark with only eleven strikes recorded. Hawaii, (Maui) "Lahaina Nov 1, 1849", dateline on gray folded letter to New Bedford Mass., entered the U.S. mails with "San Francisco, Cal., Nov 27" cds and matching boxed "40" rate handstamp, letter of report from an apparent captain of a whaling vessel "…I am now a recruiting for a cruise to the Chatham Islands (group of Pacific Islands east of New Zealand) for Sperm Oil", Very Fine. 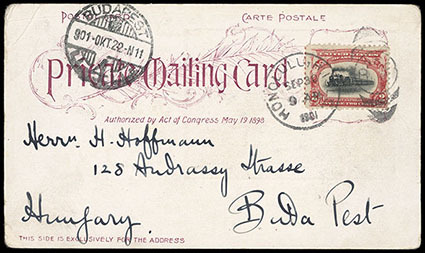 Hawaii, 1901 Honolulu to Budapest, Hungary, picture postcard franked with U.S. 1901, 2¢ Pan-Am (299) tied to "Private Mailing Card" by Honolulu postmark to Budapest, Hungary; multicolor Hawaiian scene on card; New York transit and Budapest postmarks; some corner wear, otherwise Very Fine, extremely rare destination on early picture postcard. Hawaii, Honolulu, Hawaii to Oswego, N.Y. via San Francisco (1.1), 1849 (Dec.), buff cover from U.S. Consul Joel Turrill with "per Steamer" directive, entered the mails with "San Francisco, Cal, Jan 1" circa 1850 cds and boxed "40" pre-statehood rate handstamp; corner nick, otherwise Very Fine. The San Francisco 18x13mm boxed "40" rate handstamp is recorded used from 2nd March to 9th May, 1850, this usage precedes the first reported usage by two months. 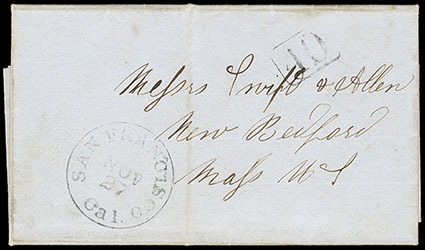 Hawaii, (Oahu) 1850 (May 22) Honolulu, Hawaii to Copenhagen, Denmark via Hong Kong, China, gray folded letter datelined "Honolulu Mai 22d 1850", carried privately to China on American Ship Robert Pulsford from Honolulu May 29th to Hong Kong arriving around Jul. 20th, red "Forwarded by Wm. Pustau & Co" framed handstamp (Sell/Rowe type 54e), entered mails with Hong Kong (7.23) double-arc datestamp and manuscript "4/-" shilling due rating, endorsed "Via Southampton", red London (9.27) transit cds and rerated "6/-" shillings due, Copenhagen (10.1) arrival cds and red crayon "84" sk final due rating; top edge tear, otherwise Very Fine and rare. A RARE HONOLULU, HAWAII USE TO DENMARK VIA HONG KONG. ONE OF ONLY TWO RECORDED EXAMPLES OF THE RED WM. 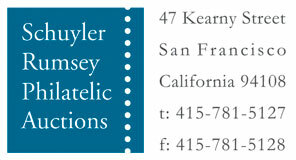 PUSTAU & CO. HONG KONG FORWARDER HANDSTAMPS. The "Robert Pulsford" was an American ship (405 tons) involved in early trade between New Zealand and the United States, transporting cargo along the coast of China and India, and finally as a whaling vessel in the Pacific Ocean. The crew made it safely to Honolulu on board Schooner "Martha" on Apr. 2nd. 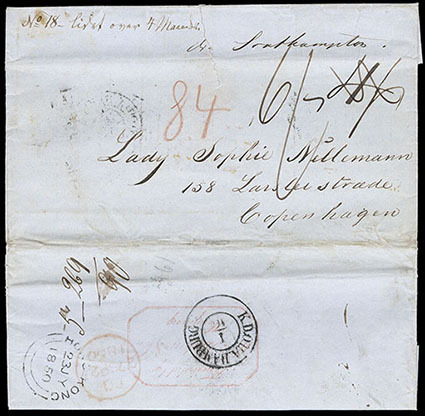 The letter was written by Ludvig Holberg Anthon to his Aunt Lady Sophie Nellemann. Ludvig was the first Danish citizen to settle in Hawaii around late 1839 and operated as a merchant. He became the Royal Danish Consul to Hawaii in 1849. In April 1852, he sold his belongings and left Hawaii for Denmark with his wife, Elisabeth Louise and their two children. However, the following year in December 1853, they returned to Hawaii and he continued as the Danish Consul until they left for good in February 1858.